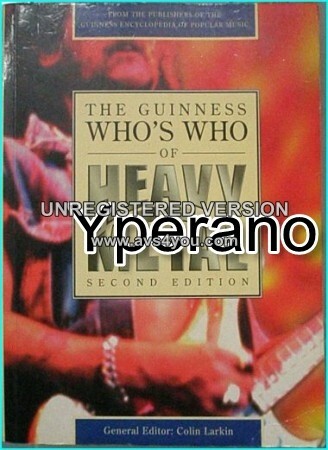 Home / Other Items / Books / The Guinness Whos Who of Heavy Metal BOOK. 2nd edition. THE definitive guide of Heavy Metal. A comprehensive guide to groups and artists performing under the Heavy Metal banner. It goes from pioneers such as Led Zeppelin and Deep Purple through the late-70s British renaissance with Iron Maiden and Def Leppard, to the present sonic attack of Anthrax, Metallica, Poison and Slayer. MANY UNKNOWN BANDS TOO!! Coming from a publisher whose music reference books have built a solid reputation for accuracy and reliability, the 1st edition of this title was something of a gift to mankind. Comes up to its claim as “”the definitive guide to the groups and artists who have performed under the Heavy Metal banner””!!! If you want to know more about Heavy Metal, then this is one of the most interesting books you’ve ever read. Bios from some of the most important artists are here.